In the Mahabharata, Manipur ( 'Mani' -Jewel, 'Pur'- City or place ), is mentioned as the meeting place of Arjuna, the third pandava and Chitrangada, the crown Princess of Manipur. 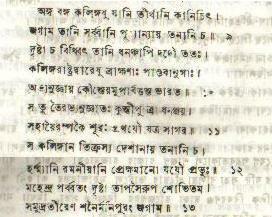 Most orthodox Bishnupriya Manipuris and Meiteis of Manipur, the present remote North-Eastern State of India, believe that the name bear itself to the proof of the existence of Aryan civilization from the pre-historic time as the Jaimini Mahabharata mentions clearly 'Manipur', 'Bishnupur' etc. They claim to be the Kshatriyas and they traced their ancestry with the Arjuna Chitrangada Babhrubahana episode of the epic Mahabharata. Described by Lord Irwin as the 'Switzerland of India', Manipur boasts of an exotic landscape with gently undulating hills, emerald green valleys, blue lakes and dense forests. It is the sheer tranquility enveloping it, interrupted only by a soft breeze that sets it apart from the other northeastern states, and makes it the ideal getaway. Manipur, literally meaning the land of jewel, is a paradise on earth when Mother Nature has been extra generous in her beauty. And from the very inception, this princely state of Manipur has always been a shinning outpost of the country in the sparse of the eastern Himalayas. It never lost its basic link with the mainstream of the Indian culture. The striking aspect of Manipur, however, is its breath taking scenic beauty. Imphal, the capital city, is surrounding by hills a Nongmaijing or Mahendra Parabata in the east and Longol in the north. In the Mahabharata, the country is mentioned as Meckley. In 1876 A.D. the King of Manipur used the same name referred to his Kingdom which is documented in the treaty with the British Government. 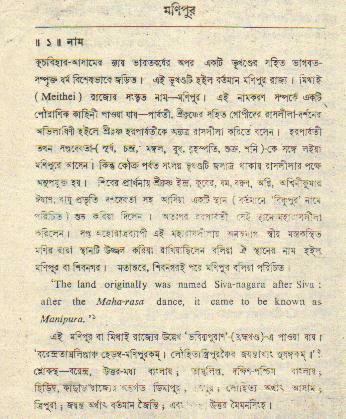 In the old Assamese records, Manipur is mentioned as Magloo or Moglai country. In Sylhet and Cachar the Manipuris are called as the Mei-Moglais in common parlance. The Burmese call the country as Cassey or Kassey. Most orthodox Bishnupriya Manipuris and some section of Meiteis believe that they are the people traced their ancestry with the Arjuna Chitrangada Babhrubahana episode of the Mahabharata and claiming to be the Kshatriyas as described in the Epic Mahabharata. On the other hand there are number of folk stories and legends regarding human inhabitation in Manipur valley. One of them holds that there was a stable kingdom with Imphal as its capital under Pakhangba, the first king of Manipur, in the first century. In the reign of Khagemba (15th century) Shri Vishnu was worshiped in Manipur. After this period, at the end of the 17th century and at the advent of the 18th century, great force of the Neo-Vaisnavism came and spread in this land. After the king Charairongba, Vaisnavism was highly developed, in the middle of the 18th century, in the reign of king Garibniwaj Pamheiba. In his time, Shantidas Goswami from Shylhet came to Manipur and he initiated the king with his subjects into Ramandi sect. Manipur’s sceneric beauty, lake and water resources, craftsmanship etc. are encompassed and picturesque. It is ful of various orchids. 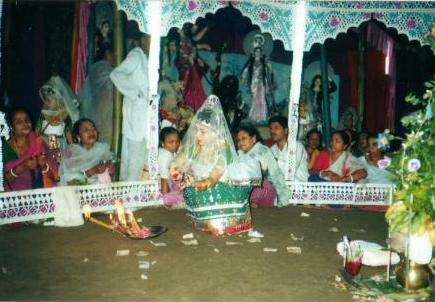 Manipur is also famous for its dances and rare and beautiful exquisite handicrafts. It has its famous Vishnu Mandir at Bishnupur of Bishenpur, Govinda Mandir at Imphal, and the Loktak lake, the biggest fresh water lake in India. Presently, the lake is projected with a Hydro-Electric power plant. The Rathband Bazar of Thangal Bazar of Khuwai at Imphal is administered entirely by the women folk and is the largest Asin market of its kind. Keibul Lamijao is the only floated national park located in Manipur. The Orchid yard of Khongapat is attractive as well as famous too. In the Mahabharata, and Dharani Sanghita, Manipur is mentioned as the meeting place of Arjuna, the third pandava and Chitrangada, the crown Princess of Manipur. Prachin Manipurer Itihas by Shri Mahendra kumar Singh States that this place, with a bay like Lake Logtak in the centre surrounded by hill -bounded plain land, was the kingdom of Chitra Bahana, a Gandharva king as par the epic Mahabharata. According to Mahabharata, his daughter Chitrangada( or Chitranggoda) attracted to Arjuna from hastinapura and got herself married to him. 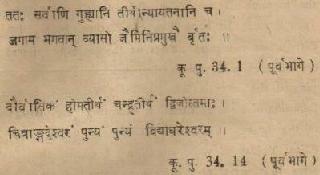 Babhrubahana is the son of Chitrangada, belonged to Kshatrya of Chandra Bangsa, ruled Manipur after Chitrabahana. after sunset. Spurred by the example of Lord Krishna and Srimati Radhika immersed in Rasleela, their privacy guaranteed by Lord Siva as the gatekeeper, Goddess Parvati had requested Lord Siva dance with her. However, sir G. A. Grierson, E.T. Dalton and T. C. Hudson holds that the Meiteis and their language is affiliated to kuki chin group of Tibeto-Burman family. 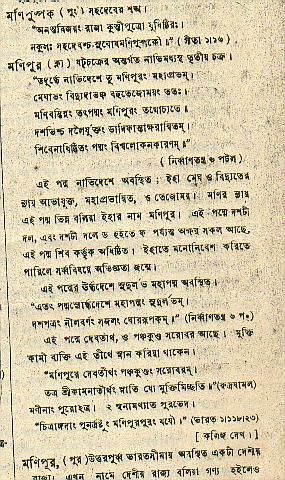 So, "to say that the earliest form of Meitei language has been developed out of Sanskrit", as stated by Dr.M. Kirti Singh, in religious development in Manipur in 18th and 19th century, pp 15-24, 1980, " is a hypothesis which at the moment cannot be proved or unproved". On the other hand Bishnupriya Scholars like Shri mahendra Kumar singha, Pandit Sena Singha, Krishna Kumar Singha, Haridas Singha and some other history writers hold that Babhrubahana and his descendents comprising of many other colonies of Indo-Aryan Stock are called Bishnupriya, speaking a language of Indo-Aryan language. According to them, They are worshippers of Vishnu and Lord Vishnu was installed by Babhrubahana from Hastinapura. Their view is that, Meiteis and Meitei language is of kuki-chin origin and a kuki-chin group language group cannot be related with the people and language of epic Mahabharata. 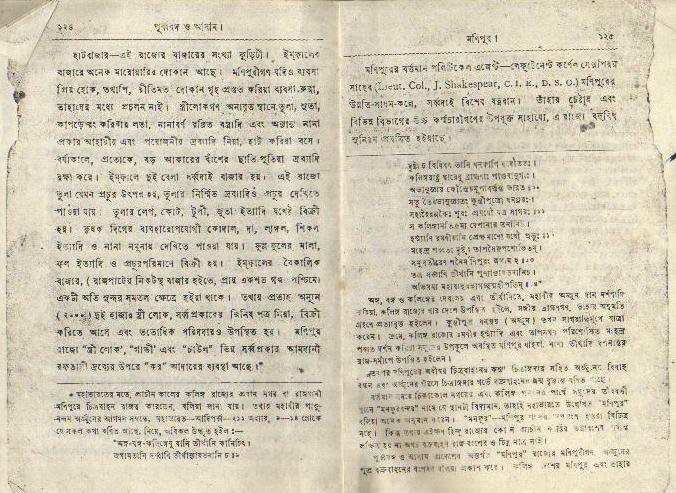 W.Shaw and Raj Mohan Nath , two eminent scholars are of the view that " Bishnupriya " with its Devanagari script had been language of ancient Manipur. Dr. K.P. Sinha has thrown up these views holding the arguments that origin of a language is to be inferred not from the history of the people; the origin of a community and the origin of their language do not necessarily go together. theme that all of mankind can relate too. It is a story of good versus evil, of families in turmoil, of jealousy and betrayal and at the heart of it all, a fight for the truth. Though they are mixed with a lot of fiction, all the incidents in the Mahabharata have a historical value. The Aryan section of Manipuris claim their descent from Babhrubahana, a son of the valiant Arjuna of the Mahabharata fame. In Mahabharata, there is reference to Manipur in at least four different places. Let us examine the second reference. After the battle, the horse, having roamed over the " whole earth bounded by the ocean", turned his face towards Hastinapura and the return journey began. Arjuna as before followed the horse. On the return journey, the horse came to Rajagriha, the capital city of Magadha. What does the above account prove ? What is the meaning of " whole earth bounded by the ocean"? Evidently the horse did not roam over the whole earth as it is known to us today. He simply roamed all over India as known to the Indo-Aryans os those days. So, " whole earth bounded by the ocean" simply means India. If we also go back to historical evidences we shall have to see the root of establishment of Hindu dynasties in upper Burma. All the Hindu dynasties settled in upper Burma had to come across Manipur from the western and Northern India by road as Manipur was only the gateway of Far-East. The beauty of the land Manipur, lake Logtak and its surrounding areas also might have attracted them and some of them settled there and reigned there for years together. impediment such as hills, forests, big rivers or wide deserts. Once the Indo-Aryans reached Sylhet, they reached the western border of Manipur in a matter of decades. Once they reached there, it was easy for them to reach the Manipur Valley, for this valley was on an international route connecting the Gangetic valley with Burma and beyond. The route connecting the western bend of the Barak with Torbung in the Manipur valley was the easiest. It was wide enough to allow the passage of elephants. McCulloch described that “ The name Manipour accounted for by the Munniporie, who quote the Mahabharata in confirmation of its accuracy. They gave the same form Muni, a jewel. This jewal formerly in the possession of the Rajas of the country ages ago. The country was at one time named Mahindrapore, but one Rajah by the name Manipur was in existence before the birth of Babhrubahana, and Mahindrapore or Mahindra Parbhata was the name of the hill, situated but a short distance to the east of the capital”. While commenting on the name of country, R.N.Nath states that the small kingdom of Manipur is situated on the eastern border of Assam on a table and surrounded by hills on all sides. It has a very large lade named Loktak, about 8 mailes lond, 5 miles wide having floating island on it. The land Manipur was formerly divided into small territories occupied by different clans of peoples, namely, the Khumals, the Moirangs, The Angoms, The Luwangs, the Ningthoujas, etc. The territories were after the names of the respective clans and they lived side by side in Manipur for centuries. In course of time the Meiteis occupied all the territories towards 15th century AD and established a sovereign kingdom known as ‘ Meitei –Leipak’ ( the land of Meiteis). 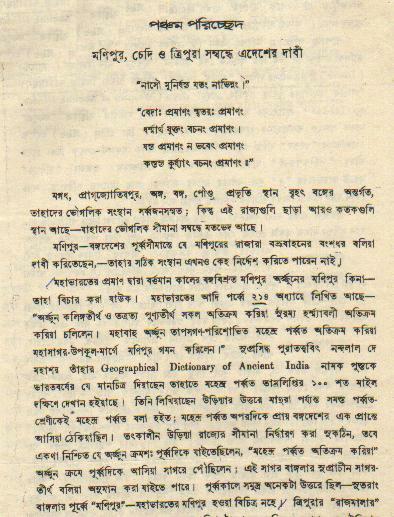 G. E.Geraini, in his work, Researches on Ptolemy's Geography, States that " Bishnupur was the ancient capital of Manipur and Imphal locally known as kangla or kangleipak was the capital of the Meitei Leipak of the later period which finds mentioned in the Meitei purana, i.e. Bijoy panchalee." So, Imphal come into existence in much later period than that of the city of Bishnupur as stated by Prof. Padmanath Battacharjee. If we talk of the history in respect of the Aryan population, their migration, settlements and cultural penetration and the development of political institutions in Manipur Valley, there are a little source of information's about this. Ancient temples like the Vishnu temple of Bishnupur, Govindajiew temple in imphal, the Kohima stone, old palaces and other related buildings etc. supply us little more historical information's. 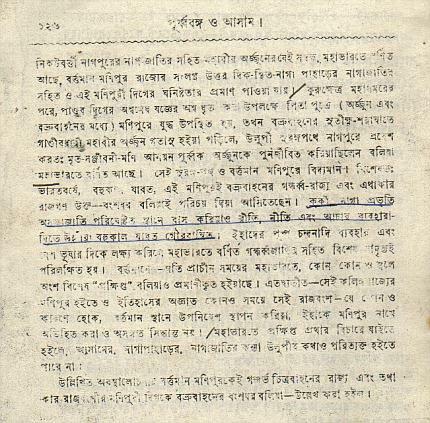 Furthermore, the establishment of an indo-Aryanstate in the remote period in Manipur in indicated by Geraini, " From the Brahmaputra and Manipur to the tonkin gulf, we can trace a continuous string of petty states ruled by those scions of the ksatriyo race, using the sanskrit or pali language in official documents and inscriptions, buildings, temples and monuments of old Hindu style and employing Brahmin priests at the propitiatory ceremonies connected with the court, and the state". McCulloch described that “ The name Manipour accounted for by the Munniporie, who quote the Mahabharata in confirmation of its accuracy. They gave the same form Muni, a jewel. This jewal formerly in the possession of the Rajas of the country ages ago. 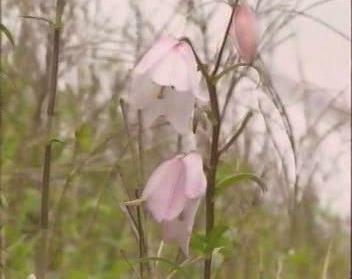 This Shiroy Lily starts blooming during the months of May-June every year on the laden mineral mountain of the Shiroy. It was discovered first by a British naturalists Mr. Kingdom ward, who gave it the Botanical name Lilium Mackleanae and won him the show in London in the 1948. Presently, it is divided into eight administrative units, i.e. districts. These are again distributed as Valley Districts consisting of Bishnupur or Bishenpur, Imphal and Thoubal and Hils Districts includes Ukhrul, Senapati, Tamenglong, Churachandpur and Candel. Besides, there are nine other important towns and about 2089 villages in the state. It has six Autonomous District Councils. They are Tengnoura Autonomous District Council. Sadar Hills Autonomous District Council, Manipur North Autonomous District Council, Manipur South Autonomous District Council, Manipur East Autonomous District Council and Manipur West Autonomous District Councils. All these administrative units are well and properly connected with the State Administration. Imphal the capital city of the State of Manipur is the largest and an important city having over one and a half lakh population. The population of Bishnpur and Moirang are 1,79,903 ( Males: 90415 and Females : 89,488) as in 1993 census. dragon. Sangai or brown antlered deer is the State animal, while Nongin remained as the State bird. Iningthiu is regarded as the State tree and the world famous Shiroy Lily ( Lilium) is the State flower of Manipur. Friday, January 21 (1972) is the Statehood day and Date of Manipur. The People - Meiteis, Loi or Chakpa, Yathibi, Bishnupriya Manipuris and Some Hill Tribes. Languages Spoken - Meitei, Bishnupriya Manipuri, Hindi, English, Mizo, Nepali and local dialects.